Squirrels are America’s meerkat. The locals don’t bat an eye at them, but the visitor finds them fascinating. While living in East Africa, meerkats were boring. Meerkats, meerkats, more meerkats. At the American zoo, they draw crowds. I haven’t seen North American squirrels in a zoo in Africa (embarrassing disclaimer: I haven’t been to a zoo in Africa. . .), but maybe African school children find them fascinating – bushy-tailed, jittery rodents that perform amazing feats of agility on power lines and tree branches. Meerkats don’t do that. While yawn inducing squirrels are ubiquitous in this climate throughout the year, I particularly notice them in the fall when they hurriedly collect and store acorns for the winter. About the same time, it seems our house begins to acquire a large supply of holiday candy and treats that will also last us through the winter. Unlike the squirrels, however, we don’t need to fatten up. But from the looks of what we’ve been making in the kitchen lately, you’d never know. Come autumn and the hoarding squirrels with their acorns, I’m reminded of our favorite acorns, which are much more edible than the ones littering our sidewalk as easy collectibles for our local rodents. 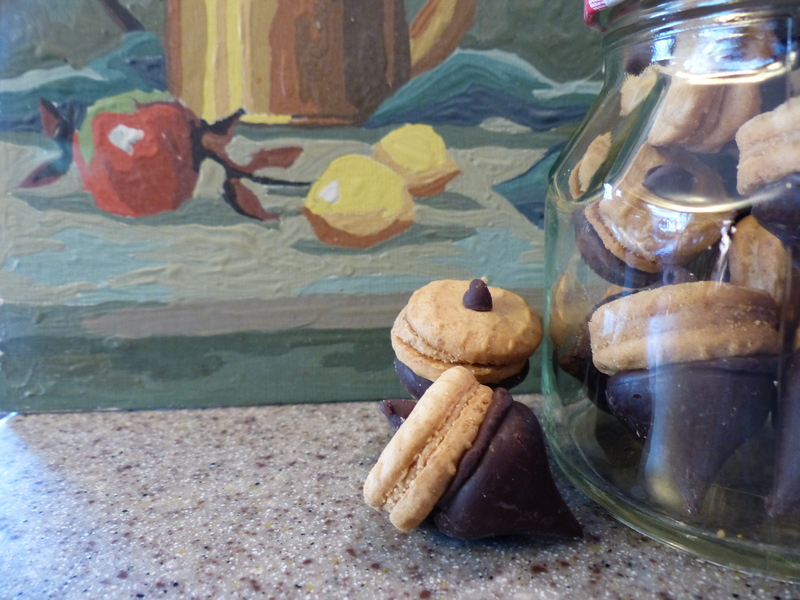 I like to make edible acorns with the “help” of my daughters. This is something I would have never made growing up as these highly processed, non-nutritious items aren’t available most places outside North America, save the occasional military commissary overseas. In fact, I don’t think Nabisco had yet invented the mini-Nutter Butter when I was four. My girls do have certain benefits growing up in the 21st century. 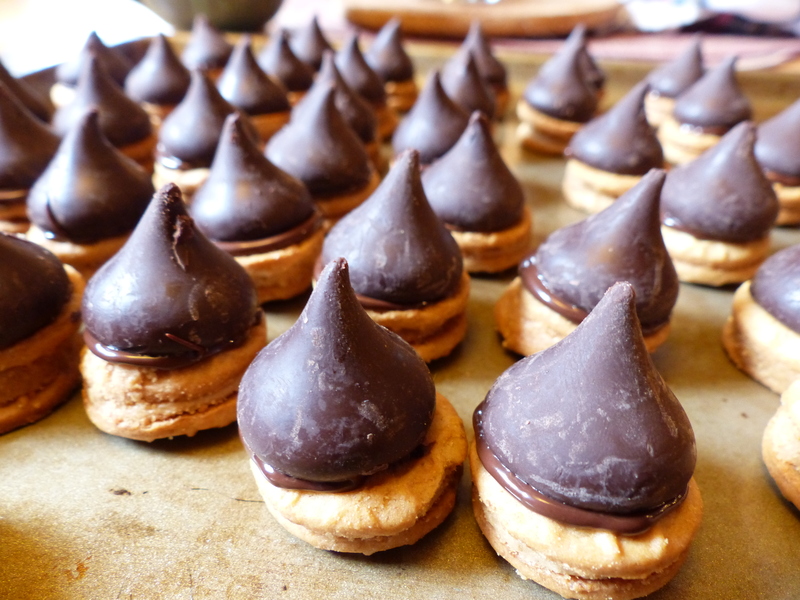 Here’s what you need: mini Nutter Butters, dark chocolate Hershey kisses and mini chocolate chips. Step One: Melt five kisses in a glass bowl in the microwave for 30 seconds. Stir until melted. OR stir over low heat on stove until softened. Then remove from heat and stir until completely melted. As simple as this “recipe” is, I botched it the first time we tried it this year. I melted mini-chips on the stove at a high heat. That will melt them faster, right? Wrong. This is not the highest quality chocolate we’re working with. It quickly grouped into little crunchy balls and never looked like the creamy melted chocolate I was hoping for. But all was not lost. I sprinkled bits of the crunchy chocolate bunches on our goat cheese, caramelized onion pizza. Saved! 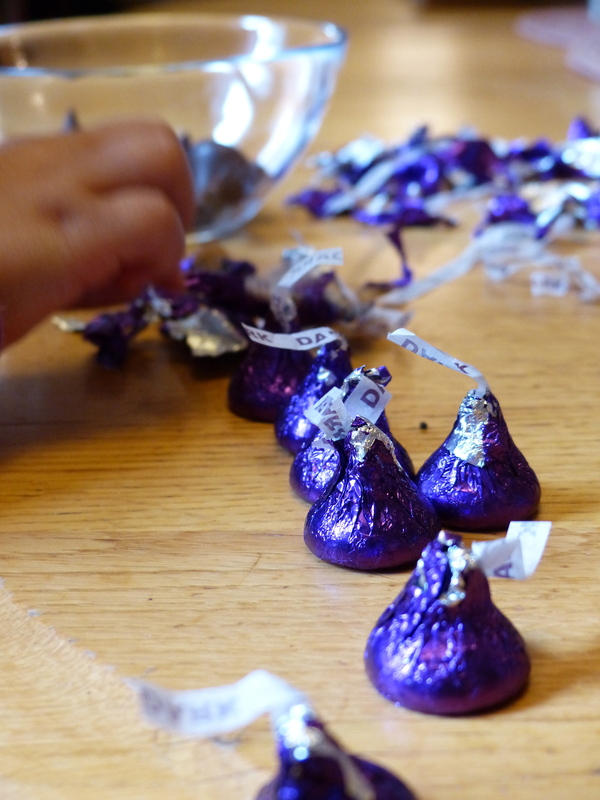 Step Two: Have the kids unwrap the remaining kisses. If there are any left after they’ve finished “helping” with that part, dip the flat edge of a kiss in the melted chocolate. Let the child put a Nutter Butter on the end of the kiss. Place on flat surface to cool and harden. Step Three: Using tweezers or just your fingers if you’re dexterous, dip the end of the impossibly tiny chocolate chip in the melted chocolate. Place it in the center of the other side of the Nutter Butter. Is that confusing? Look at the picture. It’s self-explanatory. Step Four: Put the kids down for a nap. Make a cup of coffee. Eat all the acorns. When the kids get up and ask where the acorns are, tell them you gave them to the squirrels to store for winter and you’ll make some more next year. Hahahahaha I love step 4!!! And good point about squirrels. 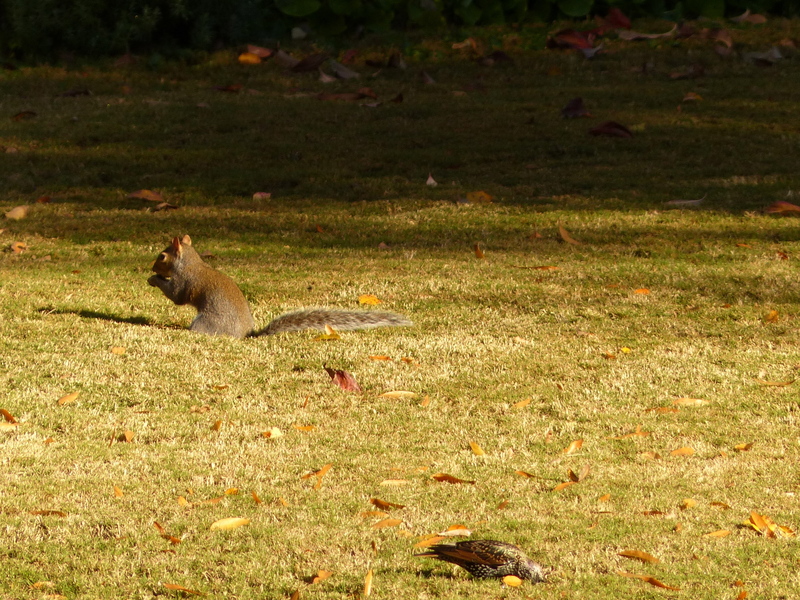 I’ve been to the Pretoria Zoo and other international zoos but I can’t remember if they had squirrels. Do those zoos have meerkats? I guess if you live in the city, even indigenous animals are interesting because you don’t get to see them often. Our zoo here in Virginia has groundhogs. If you’re a midwesterner, those are right up there with squirrels.